Bill Kobrin recently migrated 5,922 contact records from another CRM app into Highrise. At Highrise Answers, he explains the step-by-step process he used to first export a .csv file and then import it into Highrise. I tested this several times and it works and of course the HR iphone app shows the company address, phone etc. as well so the auto-dial and address mapping work. We sometimes hear from customers who want custom fields in Highrise's Deals. Now you can make custom categories for deals (shown below). Also, there are a few third-party tools out there that add additional reporting functionality to Highrise. You can see a list of them at the Extras page. More info on Highrise Deals. Btw, you can follow 37signals on Twitter at twitter.com/37signals. In "Combining Highrise and Twilio," Kurtis Welch explains how he combines the "telephony in the cloud" service with Highrise to make taking notes on calls easier than ever. I programmed my cellphone to forward all calls that receive a busy signal (ie. I hit the 'reject' button) to my twilio number. When a caller gets sent to my twilio number, twilio records the call and sends it back to my cell. When I hang up, twilio posts the url of the recording to my server. My server then grabs the recording from twilio and puts it on Amazon S3. The server looks up who the caller was and puts a note on highrise under that caller containing a link to play the audio file. This "review the call later" approach is working so well that Welch developed a similar method that allows him to initiate recorded calls, with some voice recognition thrown into the mix too. Read the post for full details. "5 More Simple Ways Your Small Biz Can Go Paperless" advises using CloudContacts to turn your business card collection or Rolodex into a searchable database. Send them your pile of 2 x 3 inch card stock, and get back standardized data that you can import into nearly any contact, e-mail, or CRM system, including Outlook, Gmail, SalesForce and 37Signals' Highrise. 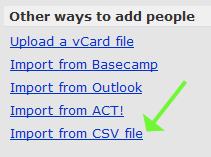 Step 1 – Click the “Highrise CSV” option on your CloudContacts’ contacts page and save the file to your computer. Step 2 – Login to your Highrise account and click the “Import from CSV file” option. Step 3 – Upload the CSV file and you will be presented with a list of fields to map. 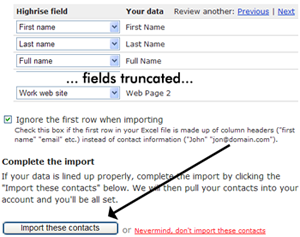 The fields will be mapped correctly so just click “import these contacts” and Highrise will begin to import the contacts. I enter new business cards into Highrise the same day I meet someone to make sure I don’t lose track of them. One class of tags indicates where I met someone (tagging everyone new I met at a conference with an “NREL PV Workshop 2010″ tag, for example). This makes it easy to send out email to everyone I met at a conference with a link to anything I’d presented, the web site, and so on. The other type of tags I use represent my relationship to someone. Tags @Lead-3, @Lead-2, and @Lead-1 indicate people I should keep in touch with in the future, talk to soon (they’ve said they’re interested in working together), or am in active discussion with about a specific project proposal, respectively. The “@” prefix is a bit of a hack, just to make all those tags sort alphabetically together at the beginning of the tag list, since they’re the ones I will review most often. I don’t use tags for technology, industry, or so on – that’s information I just remember based on the company name. Do you use tags (or another feature in a 37signals product) in an interesting way? Let us know. 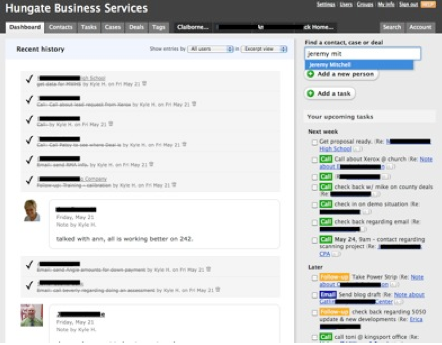 A Highrise customers asks, "Can I select the contacts I want to export by tags?" The answer: Yes. When viewing a group of contacts filtered by tag, you can choose "Export contacts tagged..." at the top of the right sidebar to download a vCard containing just those contacts. We deliver several million pages a month worldwide and a have huge number of bluechip clients, including banks, law firms and technology companies. We need Highrise to manage our relationships with our customers, where they are in the buying process, and what needs to be done next. 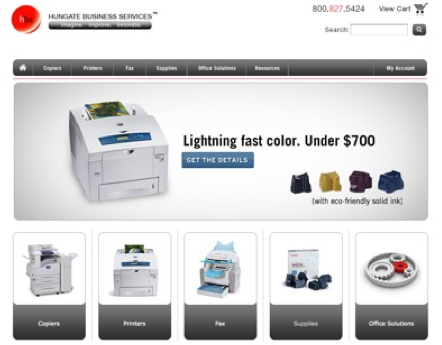 Highrise is an integral part of the business, and we use it all day, every day. It's the ultimate team productivity tool- it makes you work smarter, which means you make more money. Before Highrise, we had no system for managing our relationships with clients. It was ad-hoc, which meant that leads that were hot could often go cold – we needed a system that helped us organise contacts and collaborate on leads, and keep track of who said what and what needed to happen next. Highrise fits the bill perfectly. We have literally thousands of business contacts now. We could have never managed them before. Highrise runs on our computers all day. It doesn't require any software, servers or consultants, which means it costs less than anything else. We use the tags to classify leads by salesperson, whether they're hot leads, and where they are in the buying process. Everybody can see what everybody else is up to, so anyone can take a phone call on behalf of somebody else. Because it runs in the browser, it means we can access it from anywhere, on any computer, which means all our staff regularly work out of the office with it, and can access it even on evenings and weekends. It's liberating to use it on our iPhones at tradeshows too, and has saved us by gett the phone number or address of a client when we're on the road. The most useful features of Highrise are tags, tasks, dropbox & deals. Highrise is very malleable. Unlike other CRM's, using these basic elements, Highrise can be bent around almost any relationship management process. This means you don't need to ever 'set it up'. Some companies have a rigid process because they don't want to change their software; this defies all common sense. That's no problem with Highrise. Task management is one of the best things about Highrise. It is reminiscent of the 'Getting Things Done' philosophy. In the morning, sales staff can get straight to work on their to do list, without having to waste time figuring out what to do next. Highrise does not keep adding unnecessary features. It keeps it simple. There is no 'version 2'. This means we are never left scratching our heads – it looks the same every day – and when non-tech people are using it, this is essential. At WikiJob, we looked at SugarCRM mostly Salesforce and a couple of others. All of them required complex set up, and most required servers and technical people to maintain. They couldn't be accessed from outside the office and would require a huge investment in training time and consulting. They end up costing a lot more. Highrise was free to get started so we couldn't go wrong, and it's grown with us, so we've signed up to bigger and bigger packages as we've hired more staff. We have recently completed our single largest deal ever (over £30,000) with a well known accountancy firm. This has required the collaboration of eight people, both inside WikiJob, at the client, and at the client's advertising agency. Many documents had to be assembled, meetings had, calls made and emails followed up. 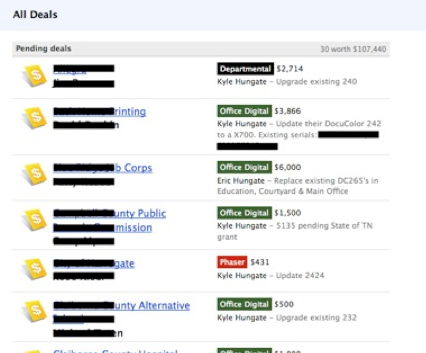 Using Highrise, Ed, our sales manager, managed to orchestrate the deal from his computer, assigning tasks to other people to provide documents or follow up, to check on the progress of their work, and to see what the client needed next. While at home, the evening before sales person Alex's visit to meet the ad agency, he reviewed all the notes from previous meetings with the client (including those he didn't attend), and was fully up to speed the next day. This lead to a number of extra documents having to be created – we made tasks for these and assigned them, and everybody followed up. As we had a constant stream, everybody was always fully aware of what was happening, and as we could assign tasks, it meant nothing could be forgotten about, and everybody was accountable for getting stuff done. The deal took over a year to come through, which meant a lot of notes, keeping track of what was said and when, and referring back for current communications. Highrise makes us ultra organised, which is key. We do all this while managing approximately 1200 other leads simultaneously – it's how we do business. On our desktops, we have it hooked it into our VOIP phone system so we can just 'click-to-dial'. It's fast and easy. Using the iCal feeds, our tasks appear on our Google Calendar's and iPhone calendars, so we're always aware of what to do next. Integration with Mailchimp means we can see who received our newsletter and whether they opened it, right in Highrise. The export functions & API are very simple for extracting data, so we use these to make extra reports and spreadsheets when the need arises. A WikiJob team member uses Highrise.